Congratulations to the Class of 2018 on the successful completion of the program courses! On June 27th, a presentation ceremony and farewell luncheon were hosted at the Pontifical University of the Holy Cross (Santa Croce). The ceremony included addresses by the Rector of the University, Rev. Prof. Luis Navarro, and the Program Director of The Rome Experience, Fr. Eric Nielsen. 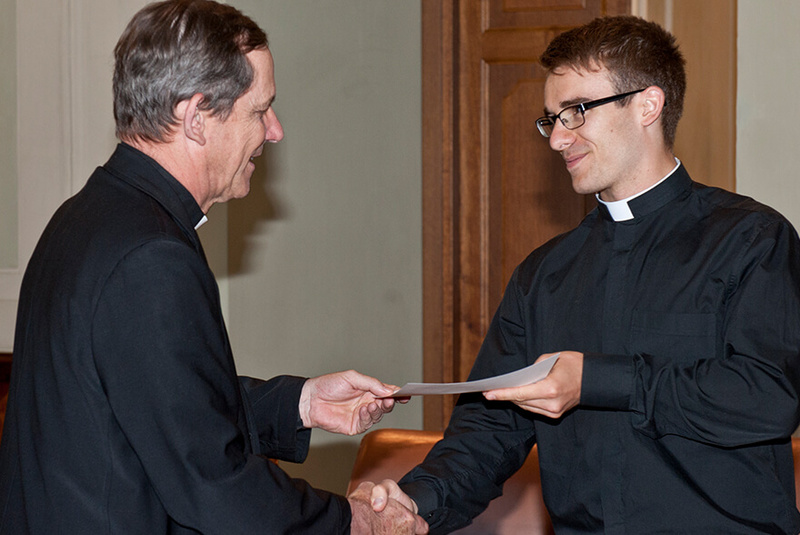 During the ceremony, the Rector presented each seminarian with a certificate of completion. Thank you to the faculty and staff at Santa Croce for always being gracious and enthusiastic hosts! The Rome Experience courses are accredited by Pontifical University of the Holy Cross. The Pontifical University of the Holy Cross was born from the desire of St. Josemaría Escrivá, Founder of Opus Dei, to create a center of higher ecclesiastical studies in Rome at the service of the whole Church. With prayer and patient work, he laid the foundations of the current University of the Holy Cross. St. Josemaria’s first successor, Blessed Álvaro del Portillo, with the support of St. John Paul II, brought that desire to completion, inaugurating the Roman Academic Center with a Holy Mass dedicated to the Holy Spirit on October 15th, 1984. Thanks to the assistance of the University of Navarre’s ecclesiastical Schools, the institution was destined to become a center of study and research, committed to the task of theological, philosophical, and canonical formation. The Pontifical University of the Holy Cross is currently comprised of the Schools of Theology, Canon Law, Philosophy, and Church Communications; the Higher Institute of Religious Studies “all’Apollinare” (ISSRA) is also an essential element. The Academic Building is found in Palazzo S. Apollinare in Rome, while the Research Center and the Library are located on Via dei Farnesi.